(Newser) – Unprepared kids who want to get out of taking a test in 2017 can just tell the teacher their mesentery hurts. Irish researchers have classified a new organ in the human body while proving "the anatomic description that had been laid down over 100 years of anatomy was incorrect," according to a press release. 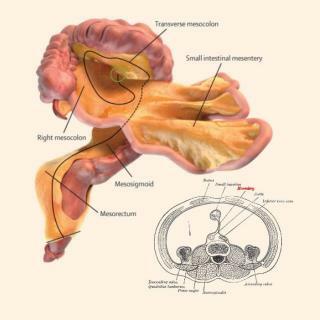 The mesentery—which attaches the intestine to the abdomen—is the 79th organ in the human body, Inverse reports. According to Science Alert, the mesentery was described way back when by Leonardo da Vinci, but scientists have long believed it was a series of multiple structures, and therefore not an organ. But new examinations of it on a microscopic level show that it is in fact one self-contained structure, meeting the definition of an organ, the Irish Examiner reports. NEWS FLASH: After decades of autopsy's on deceased politicians; no brain has yet to be found..
My first question, Is there a way that University Professors may link this intestinal organ to the Imperial Pseudo climate change Orwellian Big Screen Emotional Messiah thereby attracting military and corporation billion dollar handouts? Answer: Yes, but my mind is perfectly good so only the criminals can link their solutions for the military-industrial-secret-society network of Hitler-Maos. A very long time ago I thought I might want to be a doctor. I later learned many things that proved that was no idea, but I must say, Yucko.